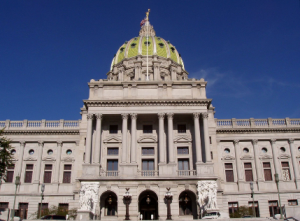 A deadline to change the way Pennsylvania draws its legislative maps in time for 2021 redistricting is fast approaching, but it seems school’s out for summer. The state House adjourned Monday, leaving in limbo a handful of important legislation — among them a Senate-approved bill to create an independent commission purported to eliminate gerrymandering. The proposal currently languishing in the House (and bogged down with more than 700 proposed amendments) would create an 11-member commission, with eight members chosen by House and Senate leaders of both parties and three picked by the governor, responsible for approving new maps. If a seven-member majority could not agree, it would go to the General Assembly to break the tie. The bill also includes a controversial proposal introduced by Senate Republicans to create judicial districts across the state, rather than allow for at-large representation. Republican legislators said the move would make judicial bodies more accountable to their voters, while Democrats called the amendment a “poison pill” used to retaliate against judges with whom legislators disagreed — including the state Supreme Court judges who invalidated the previous congressional map. The bill would need to go through before a July 6 deadline to allow for adequate public notice before voters would be given the chance to weigh in on proposed changes to the state constitution, which would overhaul the mapmaking process in advance of 2021 redistricting. “While it would appear Monday is the last day of legislation session until the fall, the chamber did leave open the possibility to return during the next two weeks,” Capitolwire reported. While the representatives could be called back into session, lawmakers and activists agree that the chances of reaching an agreement before the deadline have dimmed. “Well, we came close. We’re proud of how far we got, we’re proud we made it a statewide conversation,” said Carol Kuniholm, the head of Fair Districts PA, a coalition of volunteer activists and groups leading the redistricting reform movement in the state. But close wasn’t what Kuniholm and others had hoped for. Some are tired of waiting. WITF’s Katie Meyer reported that activists held a sit-in Tuesday afternoon at Gov. Tom Wolf’s office, urging him to call a special legislative session. “We demand representation. Their response? Go on vacation,” they chanted. The March on Harrisburg protesters acknowledged Wolf could not force a vote, and some expressed concerns Democrats also could just offer half-hearted support for reform until they earned the chance to draw maps beneficial to their candidates. New poll results show voters want Harrisburg to change the way maps are drawn. A new Suffolk University/York Daily Record poll of likely voters showed 46 percent in favor of eliminating partisan gerrymandering; those respondents said they agreed or strongly agreed with the state Supreme Court’s order to redraw the districts created after the 2000 census. Only twenty-nine percent of respondents disagreed with the court order. WITF reported that the two-dozen activists remained for about six hours before calling it a day, with some saying they have additional events planned to call attention to the issue and perhaps pressure a vote. It’s not a Judge’s job to “represent” people. They are to apply (and interpret, when needed) the law. When the few get raw naked power, history tells us they never choose to give it up. Reform only happens when The People stop ((asking)) for change and instead ((demand)) it. The political reality is that the system which does not work will continue onward in terms of gerrymandering. Blaming Gov Wolf is a Republican State House & Senate maneuver to distract from the reality that the Senate & House Republican leadership really don’t want redistricting reform. If R’s control both the Senate and the House, then no redistricting reform is their fault and no one else’s. If they really wanted redistricting reform, it would happen. What a crazy situation! I am quite curious, though, how PoliticsPa hasn’t thought to report on the fact the Governor Wolfe is attempting to gerrymander the judicial system by refusing to appoint judges to fill the vacancies across the state. All nominations have been made, but instead of appointing and letting the confirmation process begin, he is instead attempting to hijack the system in order to gerrymander the system. He will not appoint until he gets democrats on the bench – in republican elected seats.I simply cannot wait to see the impending lawsuit from this one. Talk about an october surprise! A simple formula solves this problem. Input the desired numbers into a computer, and the computer will draw a map down to the .001 percentile and that’s that. Done. FAIR. Problem solved. Take the human element out of this process or else this will always be skewed to one side or the other. Sounds great. Just agree to use MY algorithm. No, you can’t view it, because it’s a copy written code and I don’t want you stealing it. Problem solved, right? In all seriousness, I don’t think it’s as simple as you’re making it here. Also, 538 has a great podcast from the end of the year last year called The Gerrymandering Project. I would recommend everyone check it out. I believe it’s only 6 episodes or so.